Secondary School (demolished) Durham Road, corner with Prince Consort Road. Opposite the Gateshead Cenotaph. Confirmed 2015 as having been destroyed when the building was demolished. Unveiled 8th November 1921 by Brig.General Surtees, M.P. "......Platform with screens in front and wall panelling behind. The wall panelling consists of a central portion, 15 feet in height, supported on each side by sections covering the full width of the gable. The central portion is divided into three panels by two carved pillars surmounted by finials. The central panel carries at its head the arms of the school, and in the centre are the words "Pro Patria" in raised gilt letters. On the panels at each side of the centre the names of the 80 old boys who fell are inscribed, the three panels being surmounted by a handsome carved cornice. The whole forms a striking Roll of Honour, the necessary contrast being supplied by the side panelling with its effective tracery. Further interest is added to the panelled sides by incised stanzas by Lawrence Binyon, one of the best of our war-time poets. 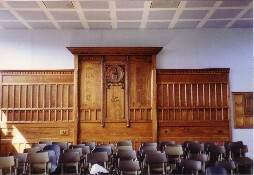 In front of the wall panelling is the platform projecting 7 feet 6 inches in the centre and 4 feet at the sides. The platform level is reached by three steps on each side of the projecting centre. Screens are erected on the front edge of each of the three sections of the platform, the central screen being carved and surmounted by a reading desk"
(Headmaster's address at the Unveiling Ceremony). They went with songs to the battle, they were young / Straight of limb true of eye steady and aglow / They were staunch to the end against odds uncounted / They fell with their faces to the foe. As the stars that shall be bright when we are dust / Moving in marches upon the heavenly plain / As the stars that are starry in the time of our darkness / To the end to the end they remain. This memorial was designed by Robert Rowell Art Master 1905-1935 / who died October 12th 1935. Draft list gives only 60 names - need all names. Public subscription by pupils, past pupils, parents and friends. 1. Originally located in Gateshead Secondary School, later called the Grammar School, where there was a platform in front forming part of the memorial and a matching reading desk. This school was demolished in 1967 and the memorial removed to its new site. The platform disappeared. 3. At the unveiling, the memorial was formally handed over to the care of the Education Committee and accepted by the Chairman, Alderman Thubron. 4. The school started in 1884 when a High Grade School was set up in Windmill Hills. It moved to Whitehall Road, then to premises at the corner of Durham Road and Prince Consort Road. The school became known as Gateshead Secondary School. In 1944 it became the Grammar School and took boys and girls until the opening of the new Girls’ Grammar School. The school remained as the Grammar School for Boys until 1968. The old buildings became inadequate; new premises were built on Avenue Road and opened in 1964. The old school was demolished to provide space for tennis courts. Following re-organisation in 1968, the school became a co-educational comprehensive under the name Saltwell Senior High School. It closed in 1990, and has been demolished. 5. The photos were taken by John Niven, a former Gateshead Teachers' Centre Warden, when the memorial was installed in Saltwell Senior High School, formerly Gateshead Boys' Grammar School. It had been placed there after the earlier co-educational Grammar School had been demolished in the 1960s. John Niven took the photographs shortly before the Senior High School closed and the war memorial was put into storage at the Dryden Centre, whence it subsequently disappeared. 6. The water colour of the Grammar School painted by Byron Dawson, included in the pictures shown here, was commissioned by the last headmaster of the co-educational grammar school, Mr G L R Brown, who referred to it in his retirement speech. It was intended that it should be displayed, along with the two war memorials, in the new Boys' Grammar School, which was done. It is now in the Shipley Art Gallery. Some years ago, with the permission of the Shipley, a number of prints were made of this painting and sold largely to ex-pupils. Illustrated Chronicle 31/03/1920 page 5 reports proposals; 05/11/1921 has photos and proposed unveiling next Tuesday; 09/11/1921 reports unveiling with more photos. Newcastle Weekly Chronicle 03/04/1920 reports proposals; 12/11/1921 reports unveiling. Newcastle Daily Chronicle 29/05/1919 reports initial thoughts; 31/03/1920 reports acceptance of proposals; 09/11/1921 reports unveiling. Memories of Gateshead Grammar School; Hugh Hedley; (a compendium of memories of some 50 ex-pupils who attended the school mainly in the 1940s and 1950s). “As the stars that shall be bright . . . “ are all from For the Fallen by Lawrence Binyon. School motto: "Toil No Soil" from Works and Days by Greek poet Hesiod. ("Toil is no disgrace, it is idleness which is a disgrace." Soil means disgrace). To the end to the end they remain. who died Oct. 12th 1935. Attwater W.   Harrison J.W. Ruddick S.L. Waud H.
Clark T.J.    Ord B.P. Smith H.      Wearmouth G.W. Dellow R.     Ridley J.      Snee J.E. Williamson W.